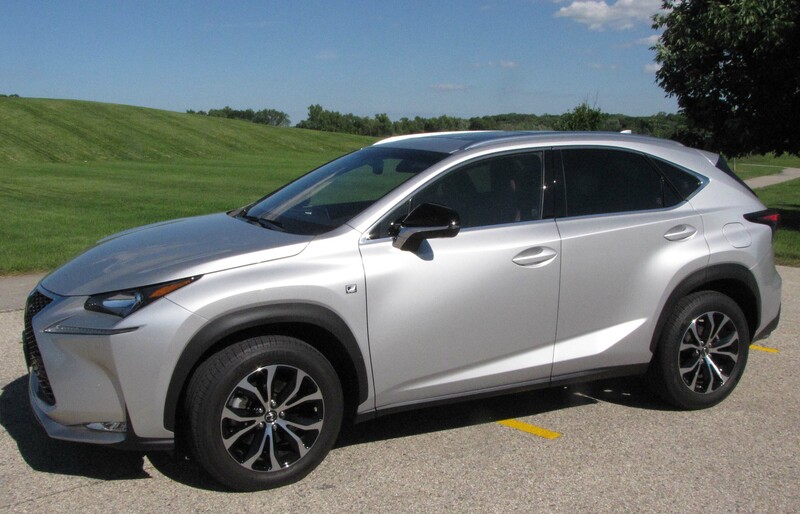 If I were selecting a smallish sport-ute solely on looks Lexus’ NX would be my first choice. I like its angular lines, its exciting sporty appearance, its 3D taillights and its front lights that appear to be large checkmarks laid sideways. I like the modern sporty look of its interior, again full of angles, and soft-touch materials used everywhere from dash to console. 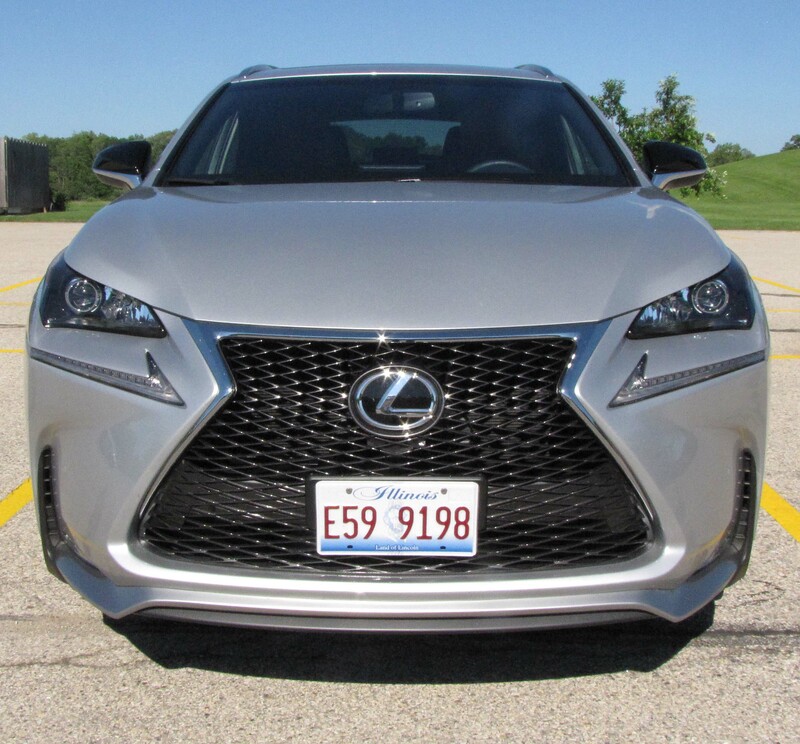 The tested NX 200t F Sport was the same silver as an earlier pre-production hybrid NX I’d driven, but its interior was a sporty black and dark red leather with textured chrome dash and door inserts and satin finish chrome around the console and center stack. 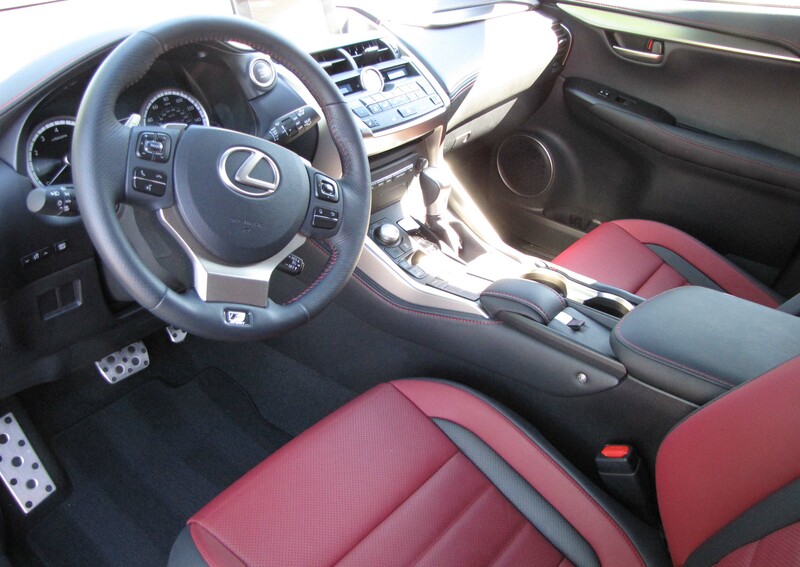 All the leather, seats, dash, steering wheel and door trim features red stitching. NX looks sharp, inside and out. Honestly, I liked this one better than the hybrid because there was power when I pressed the accelerator. The 2.0-liter I4 is pumped up with a turbocharger, Lexus’ first, and includes dual variable valve timing to create a fairly efficient power source that delivers 235 horsepower and 258 ft.-lbs. of torque. If you need to scoot, the NX with turbo will scoot. That puts something rare, sport, into a small sport-ute. Well, it rides on a 104.7-inch wheelbase and is just 182.3 inches long. That’s a couple inches longer than the recently tested Mazda CX-5, but with a wheelbase that’s a couple inches shorter. The shorter the wheelbase the choppier the ride, and that’s what makes this Lexus less Lexus like than you might expect. Ride is sharp and sporty, not always a good thing. It means you feel bumps and pavement imperfections, of which our roads have an abundance. Driving on Bay View streets was borderline painful. Highway rides were more pleasant. Sporty carries over to handling too, but here it’s a benefit. The NX gives decent road feedback with a more firm steering feel than in the early pre-pro hybrid. Steering is quick and handling aided by front and rear stabilizer bars that help it tool around corners at speed with little body lean. Braking from four wheel discs, including vented front discs, is good and this one came with AWD, a big plus during our unpredictable Upper Midwest winters. Shifting from the six-speed automatic is smooth and worthy of a Lexus. Plus there’s a knob on the console to adjust the shift points from Eco to Normal to Sport. Eco cuts performance, but boosts gas mileage. Normal is mostly fine and Sport gives you the oomph you’ll want to escape lackadaisical traffic. Overall the gas mileage is decent too, nearly as good as some lighter weight utes I’ve driven. I managed 24.25 mpg in about an even mix of city and highway miles. The EPA rates this model at 22 mpg city and 27 highway. By comparison I got 29.9 mpg in the hybrid model last winter. Going with a front-drive model with the small turbo engine gains you a bit, up 1 from the test unit to 28 mpg highway. A base front-drive NX 200t starts at $35,405 including delivery, while the AWD model starts at $36,805. This F Sport, which includes some badging, the cool red seat stitching, aluminum-clad brake and gas pedals and the sport suspension that can spank you a bit starts at $37,980 and adds a $925 delivery fee. 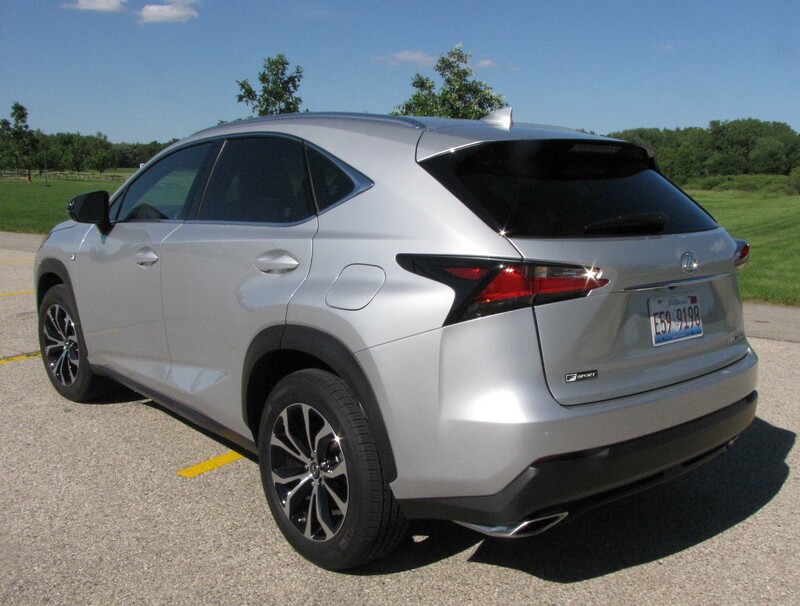 This one added a Premium F Sport package for $2,045 that included heated front seats, a power sunroof, memory 10-way driver’s seat and power tilt/telescope steering column and a power lumbar support. The other big ticket item was a navigation package with Lexus Enform, an app suite that includes Yelp, Bing and iHeartRadio and other items to display on the large dash screen that includes radio and navigation functions. The package also adds a stereo upgrade with 10 speakers. Cost is $2,140. With a power hatch, heated steering wheel, blind-spot warning system and a few other options, the test ute hit $45,313. That’s serious luxury ute territory. For that price though you get the super interior and boy is it quiet in here. The hybrid had been quiet, but you had the constant electric motor whine that could wear on a person. This cockpit looks and feels luxurious and the three-level heated seats and wheel would be welcomed in winter. Lexus’ dual climate controls work well and everything is easy to see and read on the dash. Layout is good, but there’s one major shortcoming, no radio pre-set buttons on the center stack. Like many luxury vehicles, Lexus chooses to go with a mouse-like pad on the console, but it’s a touch pad that’s extremely touchy, making it hard to use while driving. I frequently missed the radio station button I was trying to hit because as you depress the touch pad, the cursor on screen often jumps one more button up or down. Then the driver must repeat the awkward procedure. Buttons, and not touch-screen buttons, are needed for all radios for both safety and convenience. It’s time to can these awkward touchy controls! Another bugaboo is the front seats’ lower cushions. They are way too tight in the hips. I’m not tall, or wide, and it bothered me on longer drives. Several passengers asked what was “wrong” with the seats and asked if they could be adjusted. No! The driver’s seat has 10 power adjustments, including lumber, but nothing to widen the snug hip-hugging bolsters. Rear seats are quite comfortable though and there’s a reasonable 16.8 cu.ft. 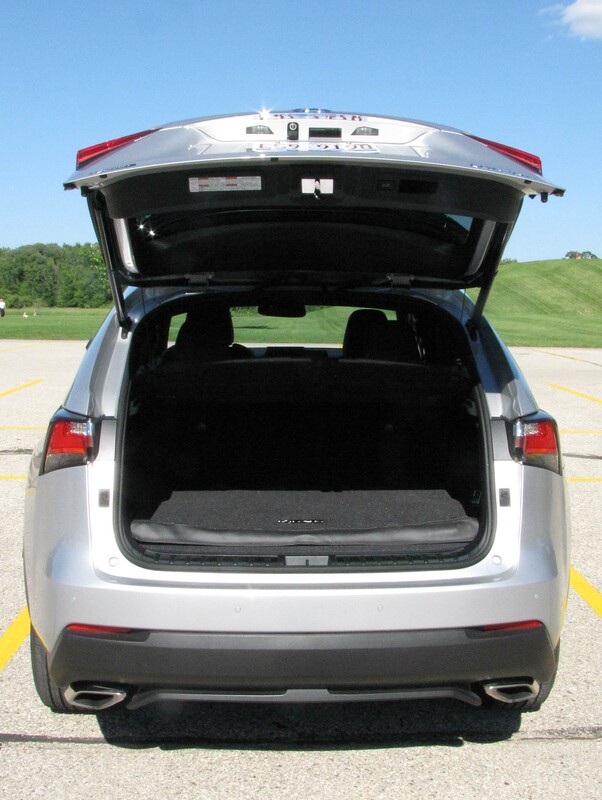 of cargo room behind those split rear seats, which can be modestly reclined for increased comfort. Overall there is 53.7 cu.ft. of cargo room with the split seats lowered. Note the thin cargo net bag that lays across the cargo area to hold items in place. Clever! There’s one other cool feature in back, the $69 cargo net. Why mention that? Well, this net is stored in a long black zippered bag that hooks into the cargo area to help keep packages or other gear from sliding about. A smart, clever feature. 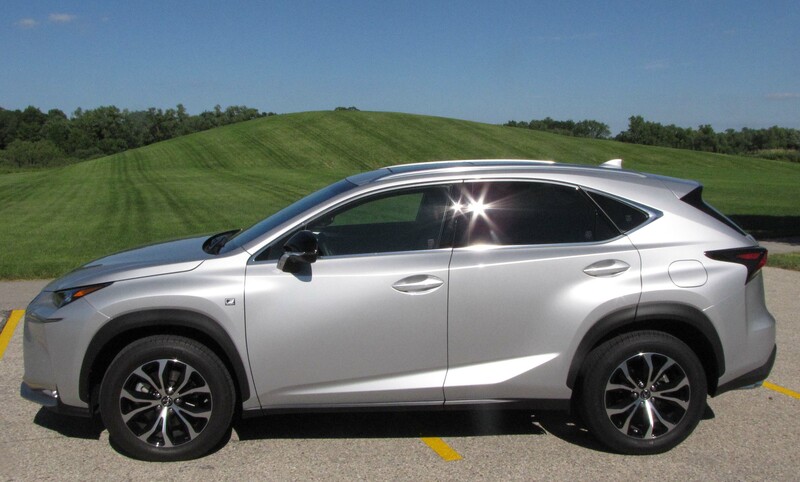 An NX purchase may be dictated by both its styling and its ride, one superior, one not. The rest of the vehicle is pretty much right on target. Hits: Exciting looking ute (don’t say that often), with good power and a gorgeous interior. Quick handling, decent gas mileage, quiet interior, heated leather seats and steering wheel, plus blind-spot warning, sunroof and power hatch. Misses: Another hard-to-use radio and nav system with touch-pad on console, narrow front seats, and a bumpy ride.